We lucked out at Weiss last week with the weather, but not with the fish. Clouds and breezes kept it bearable since it was a little cooler. But the fish did not seem to care that we were more comfortable. I thought the turnout for the Flint River tournament at Clarks Hill was bad, but the Potato Creek turnout was worse. Only three of us showed up to fish a two-day tournament at Weiss! We landed eight keepers weighing about 15 pounds and nobody had a limit. I won with four weighing 8.69 pounds. Raymond English was second with two at 4.68 pounds and had big fish with a 3.20 pound largemouth. Kwong Yu fished with Raymond and had two at 1.74 for third. My trip started badly. I had a blow-out on a trailer tired about two miles from where I was staying at Crossroads Campground Wednesday afternoon. George and Shelia, the campground managers that helped make my stay very nice, suggested OK Tires in Centre. I spent last Thursday morning riding ledges and humps, looking for deep fish. There were some beautiful drops with brush, stumps and rocks on them, with what looked like fish holding on the cover, but the only bites I got were taps and I never hooked a fish. I think they were either crappie or bream pecking at my worms with the tails dipped in chartreuse JJs Magic. Thursday afternoon when it got hot I took my tire to the tire store and Tim was great. He got a tire on my rim and balanced in just a few minutes even though they were very busy. I also found out he was a tournament fisherman and gave me some tips. He said some of the ledges I ran that morning looked good to him, too, but he had never hooked a fish on them, either. Friday morning was cloudy, so I decided to fish shallow. The first rocky bank I tried I caught a good keeper largemouth on a buzzbait. Then on a deep bank with docks on it I got two good spots about 2.5 pounds each on the buzzbait. That told me where to start the next morning and gave me hope. Sunday night and rest up before the drive home, but the appointment was too early to do that. I thought about driving home tired and sleepy and decided I might just fish one day of the two and drive home Sunday. Saturday morning, I started on the deep bank, throwing a spinnerbait since it was still dark. I was disgusted, but then a 2.5-pound spot hit my spinnerbait right at the boat and I landed it. I went back over that bank with a buzzbait but got no more bites. I then went to another bank I like and finally caught a keeper largemouth on a crankbait at about 10:00. Two hours later I went to another deep bank and caught a keeper spot on a shaky head. I was happy with three keepers with three hours left to fish. With an hour left to fish I was back on the deep bank where I started. I cast a shaky head worm behind a dock, got a tap and set the hook. Then I realized my line was over the corner of the dock. I pulled a 2.97 pound largemouth out of the water. It was hanging in the air, thrashing around. I grabbed my net and went to it but as I reached out with the net the line came off the dock and the fish took off. Somehow, I got it back to the boat and netted it. It was my biggest fish and a miracle since my line was badly frayed for a foot about two feet above the hook. Some fish are just meant to get caught. I decided to sleep in Sunday morning and drive home. I later found out Raymond and Kwong gave up at noon rather than fish until 2:00, as planned. If you go to Weiss I highly recommend Crossroads Campground if you camp. A good ramp at the Spring Creek bridge is only half a mile away. And if you have tire problems, OK Tires will treat you right and you may even get some fishing tips! This entry was posted in Bass Fishing, Tournament Fishing on August 31, 2018 by ronniegarrison. Gauzy morning light leaks through dense mature oaks and maples in a square woodlot next to an Indiana farm road. It’s only a few miles from the Michigan state line, lying just below the bottom end of Lake Michigan. Right angles predominate in this place from artificial lines laid on the land. It is well-settled here, the artifices of people everywhere. Roads run over section lines straight as ribbons over low hills in near-perfect square-mile blocks. They make the checkerboard you can see from the air. On the ground, you can hear the distant drone of a brush hog, and the comings and goings of occasional cars and farm implements as people live out their day along the rim of the Great Lakes. The backlighting of the morning sun illuminates the bugs that float aloft on the yellow beams. They remind you of dust defying gravity, caught in light bending through dirty widows. A spattering of left-over sunlight hits a tiny stream barely big enough to name. The rill, no bigger than a groove in the glacial till, gets much attention from fish biologists. This manicured site belies what’s below. Swimming in this pleasant little purl of water is an alien invader that’s become naturalized—and entirely by accident. Its existence here is as incongruous as finding ice cream in an oven. The sea lamprey as its name implies is naturally at home in the salty waters of the Atlantic. But the unintended consequences of connecting the Great Lakes more directly to the seaboard for commerce via the Welland Canal essentially put the invasive lamprey in this otherwise bucolic scene. Their invasion into the Great Lakes dates to 1829, and by the late 1930s, they populated all of the Great Lakes. A saltwater fish swims in the tiniest of freshwater upland farm creeks ringing much of the Great Lakes basin. It’s had a real down side. The lamprey is a fish. On the evolutionary scale, it’s primitive–without scales and without bones. Its slightly cone-shaped circular mouth is loaded with rings of sharp raspy teeth. It’s a parasitic pest that makes a living by grating onto its host, sucking blood and body fluids as it clings along for the ride. As you might guess that’s hard on a host fish. 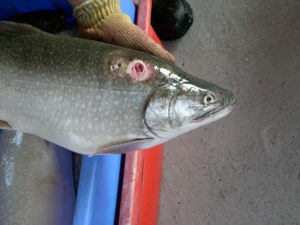 And fish species native to the Great Lakes such as the lake trout have suffered for it. The sea lamprey will spend 12 to 20 months in its parasitic phase in open water, killing up to 40 pounds of fish. Lake trout are not the only fish to host the invasive lamprey; steelhead, whitefish, lake sturgeon, salmons, walleye, and yellow perch often get the parasite. But lake trout populations have taken a measurable toll: prior to the lamprey explosion in the 1950s, about 15 million pounds of lake trout a year were harvested from Lakes Superior and Huron. Ten years later, only 300,000 pounds were pulled from nets. In Lake Michigan alone, lake trout harvest went from 5.5 million pounds in 1946, to a mere 402 pounds seven years later. 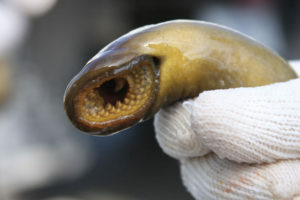 With Great Lakes fisheries devastated by invasive sea lamprey, the Great Lakes Fishery Commission directed the scientific testing of some 6,000 substances to determine what might control the damaging parasite. In 1958, the compound commonly called “TFM” proved its worth. This selective lampricide could suppress the invasive parasite while still in streams. Registered for permitted use by the EPA and Agriculture Canada, TFM has met all safety criteria for use in Great Lakes streams. Under the auspices of the Commission, U.S. Fish and Wildlife Service biologists now apply TFM in roughly 250 streams tributary to the Great Lakes, such as the unassuming rill on the Indiana-Michigan state line. It’s not the adult lamprey sought by biologists applying TFM to streams. The adult lampreys swim into the tributaries in the spring of the year to spawn and then die. Their eggs hatch in gravels, and the worm-like larvae move into muck to live out the next several years before turning to parasitism and moving into open lake water. The compound TFM kills sea lampreys in the larval stage. While TFM is the primary means of suppressing sea lamprey populations, it is not the only one. Barriers built across several streams block sea lamprey from moving upstream to spawn. Sea lampreys lack an ability to leap; hundreds of low-head barriers on streams across the Great Lakes basin create impassable heights and prevent sea lampreys from migrating, thus reducing the necessity of applying TFM above barriers. The ancient Greek adage, “make haste, slowly,” applies here. A great deal of experience and much scientific experimentation has brought sea lamprey control a long way from the nadir of the 1950s. Well-trained and dedicated biologists go after sea lamprey in a measured, deliberate way. On any application of TFM, the U.S. 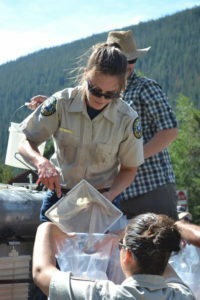 Fish and Wildlife Service will have deployed staff with an impressive array of expertise: chemistry, limnology, fisheries science, and hydrology. The field work is physically demanding. That work is paying off. Desirable sport and commercial fisheries valuable to people are on the rebound. But we can’t let up: a single female sea lamprey may lay up to 100,000 eggs. The past can’t be undone, but with science and technology, fisheries professionals can rewind it a bit. And it starts upstream, in the smallest of rills in the uplands that pour into the Great Lakes. This entry was posted in Fishing Tackle on August 30, 2018 by ronniegarrison. What is the strangest bait you have ever used to try to catch a fish? I have tried some weird things, and some of them even worked! When we used to run trotlines, jugs and limb lines at Clarks Hill for catfish, little bream were our best baits. But one time I heard little chunks of Ivory Soap would work, so I cut up a couple of bars and tried it. Never caught a fish on it though. One summer Uncle Slaton and his family camped with us at the lake. We fished for bass during the day and ran hooks at night for cats. He came in for lunch one day with a nice channel cat and said he got it off a trotline that was baited with black plastic worms. Since I had some old ones we cut them in half and baited up a line with them. Nothing on the line the next day. Then he told me he was kidding; the line was baited with cut fish. The joke was on me and I will never forget it. We used a lot of other baits than live bream, too. I heard catfish really loved cut mullet since they are oily, so we would buy one at the grocery store, cut it into one-inch chunks and bait hooks. It worked, but not as good as live bream in my opinion. We dug bait, too. Big swamp wigglers worked well but for some reason catfish did not seem to like the white grub worms we sometimes dug up and tried. And mole crickets never worked well. Maybe they had a bad taste. If you run lines, stick with what works for you. This entry was posted in Fishing Ramblings - My Fishing Blog on August 29, 2018 by ronniegarrison. 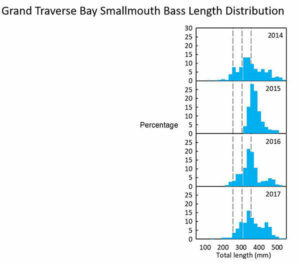 Here’s an interesting update from Michigan’s DNR on a study of Lake Michigan’s smallmouth bass populations and their growth and migration. 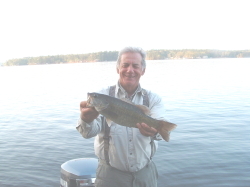 mid-1950s by Dr. Carl Latta, hinted that smallmouth bass just may travel much farther than researchers initially understood. 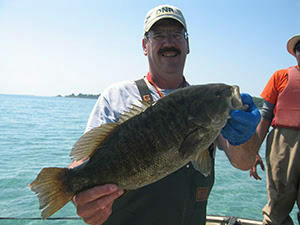 Historical data on the northern Lake Michigan smallmouth bass population was collected via very limited surveys from the mid-1950s, through the late 1990s. Then in 2005, an ongoing smallmouth bass survey was launched jointly with Central Michigan University (CMU) to look at population trends in the species. When the study was initiated, the Beaver Island Archipelago area was chosen as the main study area. It was the location of CMU’s biological station and more importantly the residents of Beaver Island were concerned about the local bass population believing increasing numbers of cormorants locally were the direct cause of the decline in the local bass population. In 2009, the study area was expanded to include the Waugoshance point area, then again in 2014 to include Grand Traverse Bay. The initial study started to unravel some of the mysteries of these local bass – not limited by cormorants but rather these fish traveling to other areas of the lake. Researchers use small trap nets to capture smallmouth bass, place metal jaw tags on them and then return them to the water. In the first couple of years of the study, a select few bass were also surgically implanted with an acoustic tag. These fish were then tracked almost daily throughout the summer months to determine their whereabouts. The “why” is still a big question that has yet to be answered through the course of this 60-plus year study. Researchers have some good guesses, but specifics are hard to pinpoint. That wandering is part of the reason the study expanded to other areas, with the potential for Lake Charlevoix to be added in the future. And while the “why” continues to go unanswered, lots of other great information is gleaned. Hettinger explains between the fish captured or recaptured through this study each year – plus the jaw tags reported by anglers – they’ve developed this immense spread of data that gives a pretty clear picture of how the fish are growing and how the pattern of the population lays itself out. That information becomes critical when working on potential regulation decisions – particularly when concerned members of the public report a lack of big fish in the area. The area currently has two different sets of bass regulations – Waugoshance and Grand Traverse Bay are the same but the harvest opener at Beaver Island opens later in the year. All three points are very popular with bass anglers – further proving the value of this study as the department manages the fishery for future (and current generations). 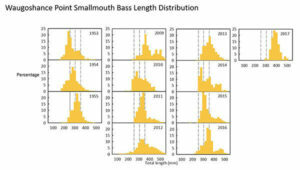 See below for graphs showing length distribution of smallmouth bass in the three areas this study covers. This entry was posted in Bass Fishing, Conservation on August 28, 2018 by ronniegarrison. The electrofishing boat has two booms which deliver an electric current into the water. Each year during late May and early June, the regional office gets a phone call or two about some strange things happening during the wee hours of the morning on some local lake or pond. I even had one caller exclaim once that a UFO had landed on the pond! If you see such a thing, rest assured it is probably not a UFO, but rather your regional fisheries staff working late nights to collect fishery resource information. Each year about this time, the regional fisheries staff of the Sebago Lakes Region sample 2-4 different waters to collect baseline information on the bass population(s), as well as determine the relative abundance of other fish species. Sampling is done at this time of year during the night, because the fish are more likely to be in shallower water spawning and are less likely to be spooked by the approach of a boat. Each bass is measured and weighed, so biologists get a clearer picture of the bass population in the lake. 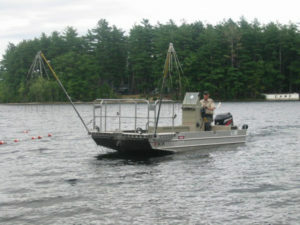 This sampling is performed with an electrofishing boat. A what? An electrofishing boat has an onboard generator that delivers an electric current into the water, which temporarily stuns the fish so they can be collected with nets. Because the work is done in pitch black conditions, there are lots and lots of lights, beepers, and motor sounds…no wonder we get mistaken for aliens! Prior to sampling, we survey the shoreline habitat of each lake (in daylight) and categorize the shoreline habitat into different habitat types (i.e. sand, cobble/rubble, muck with weeds, etc.) and mark the start and end of each with a GPS unit. Since most lakes are too large to sample the entire shoreline in a night. We then take the habitat data for the entire lake and develop partial sampling transects of each habitat type relative to their proportion in the lake. Once determined, coordinates for these sampling transects are entered back into the GPS, so we can navigate in the dark. The boat hugs the shoreline and biologists are ready to net any fish that are temporarily stunned. The boat is operated by a crew of three, one boat driver and two netters. Fish are stunned, netted, and placed into a live well for each transect. After one or two transects are sampled, the bass are anesthetized then each is measured, weighed, and returned to the lake or pond to recover. This work is repeated for each transect until completed, which is typically sometime between 2:00 and 3:00 a.m. Sometimes the night drags into early morning, but the onboard work lights allow biologists to accurately measure and record the data they need. To date, we have collected baseline data on about 50 regional bass waters. 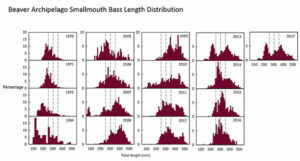 This baseline length, weight, size class structure and catch per unit of effort data (abundance) on bass gives us a basis for categorizing waters by fishery quality, comparing populations or performance among other regional waters, and for evaluating changes in population characteristics over time due to varying regulations, environmental conditions, or other variables. The next time your “upta camp”, beware of those nocturnal biologists. Hopefully, we will not be interrupting your peaceful evening, but if we do…it’s all to evaluate, protect, and enhance our important fishery resources. The controls at the helm of the electrofishing boat are a little more complex than most center consoles. Once the fish are measured, they are released back into the water, so lunkers like this one can be caught again. This entry was posted in Bass Fishing, Conservation on August 25, 2018 by ronniegarrison. Fishing a club tournament last weekend at Clarks Hill strongly reminded me of why I like night fishing this time of year. We fished 17 hours – 6:00 AM to 3:00 PM Saturday and 6:00 AM to 2:00 PM Sunday. It was hot, and the fish didn’t bite very well. When I was a teacher and school administrator I had summers off. Several times each summer I would leave Griffin and get to my place at Raysville Boat Club on Clarks Hill Sunday afternoon about 6:00 PM. After unloading and getting the boat in the water I would fish topwater until dark, about 9:00. I caught some big bass, several over six pounds each, doing that. Then I would come in, shower, eat and go back out and fish all night. In the dark I caught bass on Texas rigged plastic worms, spinnerbaits and crankbaits. Most were smaller, in the one to two-pound range. As soon as the sky started lightening up the next morning I would switch back to topwater and often catch some bigger fish. As soon as the sun started getting hot, usually around 9:00 AM it was time to go in, shower and eat again then go to bed and sleep until about 5:00 PM and do it all over again. I would do that for a week at a time. It was great fishing at night during the week. The lake was peaceful and quiet, with no boats on the water with me. I saw lots of critters from beaver to deer doing their night activities. And I caught fish every night. Back then it was popular to have a “black light,” an ultraviolet light, shining out from your boat. It made your line shine, so you could see it, and also had a regular light feature that let you see what you were doing in the dark. I never tried that. When fishing in the dark I wanted it completely dark, with no light. I did try a regular light. I had read about using a purple spinnerbait at night and I discovered I caught a few fish with one if a light was on, but never got a bite on a worm. But I caught more on the spinnerbait, and a lot on worms, with no light at all. Linda fished with me one night on Labor Day weekend and it was so dark I could not see my reel in my hand. We were fishing a deep, rocky bank with worms and she said she thought she had a bite. I told her to set the hook. I felt the boat rock and heard her say “It feels like a big one.” Then there was a huge splash out in the dark. I picked up the net and put it over the side of the boat but could see nothing and did not dare shine a light on the water and spook the fish. Another splash closer to the boat made me nervous since I knew I could not net it, then it jumped a third time, right into the net! That seven-pound, ten ounce bass hangs on our wall. This entry was posted in Bass Fishing, How To Fish on August 24, 2018 by ronniegarrison. In Michigan – a state with more than 3,000 miles of Great Lakes shoreline, more than 11,000 inland lakes and more than 36,000 miles of rivers and streams – you are never farther than 6 miles from a body of water or 85 miles from a Great Lake. With such an abundance of water to enjoy, it’s no wonder Michigan is home to 4 million boaters. The state ranks third in the nation for both watercraft registrations and total expenditures for sale of new powerboats, trailers and accessories. Making sure the state’s millions of boaters have ample opportunity to get their boats out on the water is the focus of the DNR’s Waterways Program. “There are over 1,300 state-sponsored boating access sites throughout Michigan and 82 state-sponsored harbors along the Great Lakes – at a total value of over $1 billion,” said Jordan Byelich, DNR waterways development program manager. Byelich explained that funding for public recreational boating facilities – land acquisition, design, construction, operation and maintenance – comes from boat registrations, the Michigan marine fuel tax and user fees. Projects also may be funded, on occasion, with federal dollars through the U.S. Fish and Wildlife Service and U.S. Coast Guard. The DNR has renovated several boating access sites and harbors around the state. One example is the recently constructed and expanded piers for mooring along Snail Shell Harbor at Fayette Historic State Park in Delta County, which offers a floating dock system with seven finger piers – one that is 38 feet long, two that are 45 feet long and four that are 60 feet long. As part of a major reconstruction project at East Tawas State Harbor in Iosco County, boaters now can access modern amenities, improved safety features and a better connection to the local community. The project helps the harbor respond to current trends in Great Lakes boating. The facility now features many enhancements, including new piers, a greater variety of slip sizes, compliance with the latest Americans with Disabilities Act standards, new electrical pedestals, as well as a new pump-out system. Connection to the downtown area, which is popular with boaters, also has been improved. Another DNR facility improved recently is the boating access site at Silver Lake State Park in Oceana County. The work was part of a redevelopment project that relocated the launching area, dredged a new channel, added parking for vehicles with trailers, improved circulation, and created separation of the day-use area from the launching area supporting improved safety and functionality within the park. Boating access site improvements included adding a two-lane concrete launch ramp, dredging a 300-foot channel to deeper water, a vault toilet, and a maneuvering area for launching and retrieving boats. A recent renovation project at the Jewell Road boating access site in Cheboygan County, which accesses Mullett Lake, addressed erosion issues at the site and included removal of an old concrete ramp, which was replaced with a new double-lane ramp. The site’s parking lot was also paved as part of the project. State-funded boating facilities are quite popular with Michigan boaters. And while many harbors see heavy use, others don’t get used as much as they could. Straits State Harbor in Cheboygan County is among them. Straits State Harbor’s state-of-the-art, sustainable design has earned it certification as a Michigan Clean Marina, a designation given to sites that adopt marina and boating practices that reduce pollution and enhance fish and wildlife habitat. The state harbor facility – the only one in Michigan using wind turbines for electrical generation – also gives boaters who want to go to Mackinac Island another option, as the very popular Mackinac Island State Harbor is often crowded. “Straits State Harbor has capacity and is a great way to access Mackinac Island – it’s a good option by taking a ferry,” Olson said. The location of the harbor’s boat launch also offers some unique benefits. In the DNR’s 2017 harbor survey, 93 percent of respondents said they would visit the harbor/marina again, and 90 percent said they would recommend the facility to a friend. This support of public waterways facilities is evident. For example, just nine of the state harbors pump a total of more than 300,000 gallons of fuel to boats each year. Boaters can find location and amenity information about boating access sites and harbors within the Michigan Recreational Boating Information System. Information on harbors also can be found in the Michigan Harbors Guide. Many harbors accept reservations, which can be made at midnrreservations.com or by calling 800-44-PARKS. June 9-16 marks Michigan Boating Week, when the DNR invites residents and visitors to celebrate the state’s unparalleled freshwater resources and boating opportunities. While enjoying Michigan’s waters, it’s important that boaters protect themselves and others by following important safety tips. Boaters born after June 30, 1996, and most personal watercraft operators must have a boater education safety certificate. The DNR also recommends a boating safety course for anyone who plans to use a boat or personal watercraft. Classes are offered at locations around the state and online, making it convenient and affordable. Make sure the boat is properly equipped and equipment is in good working order. Carry a cell phone or marine radio. Watch a video on how boaters can help stop the spread of invasive species. Find more information about Michigan boating – maps, safety, closures, rules and regulations, and more – at www.michigan.gov/boating. Water is Michigan’s largest natural resource, and with so many opportunities to access our state’s freshwater paradise, it’s easy to find a facility that will float your boat. This entry was posted in boats and boating on August 23, 2018 by ronniegarrison. In the Flint River Bass Club tournament only four of us showed up. We weighed in ten bass weighing about 15 pounds and one fisherman didn’t weigh in anything. I won with eight weighing 11.90 pounds and had big fish with a 4.62 pound largemouth. JJ Polak had one at 2.19 pounds for second and Chuck Croft had one at 1.04 pounds for third. The other three wanted to quit at noon both days but club rules say times are set at the meeting. The first day everyone was there at 3:00 but Sunday I was the only one, the other three gave up at 10:00 that morning and went home! I started Saturday morning on a bridge riprap and landed three keepers, one on a spinnerbait and two on a crankbait, before the sun came up. Then I tried a bunch of deep rocks and brush I had located with my electronics on Thursday and Friday in practice. I caught one on a rock pile in 20 feet of water. I was real frustrated about 8:00. The third place I had planned on fishing some deep rocks and brush in 22 feet of water on a long main lake point with fish holding on them. But when I got where I could see it there were two boats anchored on it, fishing live bait. I saw one catch what looked like a keeper bass but never got to fish there that day. Sunday morning, I headed to the bridge and caught one keeper on a spinnerbait but an hour later, after trying several baits, never got another bite. I next went to a deep rockpile where I have caught fish in the past and had seen some on it on Friday, but I guess they were crappie. I had got several bites on it Saturday but never hooked a fish, and that repeated Sunday morning. Some brush was near those rocks and I had fished them Saturday without a bite, and almost didn’t go to it. But I did, and at 8:00 got a thump on a shaky head worm jiggling it in 25 feet deep in the brush straight under the boat. It was the 4.62 pounder. I then headed to the main lake point and there were no boats on it. I managed to catch my third keeper on it on a drop shot worm as soon as I stopped but got no more bites after more than an hour. At 12:20 I went back to the brush where I caught the big one and caught my second biggest fish out of it on a Carolina rig. That was it and I had to weigh-in all by myself. I wish we would fish at night but this weekend the Potato Creek Bassmasters is fishing Lake Weiss from 6:30 AM to 3:00 PM Sunday and 6:30 AM to 2:00 PM Sunday! And I will be there. This entry was posted in Bass Fishing, Tournament Fishing on August 22, 2018 by ronniegarrison. CLEAR CREEK, CO — Once thought to be extinct, the rare greenback cutthroat trout is making a big comeback thanks to the efforts of the Greenback Cutthroat Recovery Team – a partnership that includes the US Forest Service, Bureau of Land Management, US Fish and Wildlife, the National Park Service, Colorado Parks and Wildlife, the Western Native Trout Initiative, and Trout Unlimited. Feeling inspired? Learn more about Native Trout across Colorado – the efforts to protect and restore populations and ways to get involved. U.S. Forest Service-Arapaho & Roosevelt Natl Forests Pawnee Natl Grassland, U.S. Fish & Wildlife Service Southwest Region, Pikes Peak Chapter of Trout Unlimited #508, St. Vrain Anglers Trout Unlimited, The Greenbacks | Colorado Trout Unlimited, basin + bend, Western Native Trout Initiative, Dublin Dog Co., West Denver Trout Unlimited, Cutthroat Chapter of Trout Unlimited,Boulder Flycasters, Colorado Parks and Wildlife,Trout Unlimited, Gore Range Anglers – Trout Unlimited and Upslope Brewing Company. A big shout out to all the volunteers who came out to hike and haul the native trout to their new homes, and to the various groups and agencies that came out to restore Colorado’s native fisheries. Read the full story that CBS Channel 4 News did here. This entry was posted in Conservation, Trout and Salmon on August 21, 2018 by ronniegarrison. I liked digging when I was young. It was not something I had to do, and my body didn’t mind so much. Everything from digging for red wigglers for bait to trying to dig a hole to China kept me busy. We had 11,000 laying hens in seven houses behind our house. The water troughs drained constantly behind each house, making wet and very fertile dirt the worms loved. It was easy to get a coffee can full of great bream and catfish bait. On our annual family trips to Ocala Florida to see my aunt, uncle and grandmother, I could not resist digging in their back yard. The sandy soil was great when compared to the dirt at home. I lived on Iron Hill Road, appropriately named for the red clay and red rocks everywhere. In the week we were in Florida my brother and I would often dig holes deeper than our heads, only about 4.5 feet deep probably. The older folks would jokingly ask if we were trying to dig to China and we took it seriously. We thought we could. Digging for Indian artifacts and buried treasure was always fun. After reading Treasure Island I was convinced pirates had somehow found their way to our farm and left chests of gold and jewels. Although I never had a map, any unusual rock outcropping had to be a marker for the loot. One of my cousins lived on a farm a few miles away and I would go spend a few nights several times during the summer. Another cousin lived next door and we spent all the days outside, fishing the creek behind their houses, exploring the woods and generally having fun. In their field there was a huge boulder, so big we could hardly get up on top of it. It was the only one in the area. My cousin got the idea it marked a grave, much like the pyramids. Although the rock was round, it was buried a couple feet deep in the ground. I spent many hours with them trying to dig down on one side, so we could roll the boulder to the side. And they worked on it almost every week. Even with cut saplings as pry bars, we never so much as rocked the rock. The only sandy soil on our farm was along Dearing Branch. Every summer my friends and I tried to dam it. A dozen yards downstream from where the branch came under the fence on our property line two trees about four feet apart narrowed down the channel. Above it was a wide pool of water. The trees made a perfect place to make a dam. We managed to drag an old crosstie and put it in front of the trees. Then we spent hours digging up sand, putting it in old crocker sacks to make sand bags to put around it. Our sandbags got too heavy to move with the wet sand in them, but we learned to fill them half way up, drag them in place then finish filling them. We must have moved tons of sand over the years. Digging it out of the pool made it wider and deeper. But no matter how much we worked, the first big rain would wash out our dam, and fill in the pool with new sand to move. As I got older digging became more purposeful. My first house in Griffin on College Street had a full basement that got water in it every time it rained hard. I finally figured out a French Drain ditch along one wall would help. Daddy visited and helped me dig a ditch along that wall. The lower end was ground level, but the upper end was almost eight feet deep. We spent hours digging a ditch about two feet wide along that wall, putting a couple of feet of gravel in the bottom around a perforated drain pipe, and filling it back up. There was no good place for a dam on our property since the branch ran along the property line, but my mother really wanted a pond. Daddy got the idea of putting one in a field that was somewhat workable since it had a drain across it. He had a dam built across it and after a heavy rain it did fill part way up, but there was not enough drainage to keep it full. The neighbor a few hundred yards away had a pond with the dam near our property line, but there was a hill between it and momma’s pond. So, we dug a ditch across the hill, put a pipe in it and put a water ram at his dam. We had to dig down eight feet at the top of the hill and the ditch ran about two hundred yards. I spent many hours in the bottom of it with a pick ax since there were big rocks there. But we managed to get it done and kept mamma’s pond full. When I moved to Pike County in 1981 I wanted a garden. I cut the trees behind my house, clearing an area about 150 by 200 feet, got it cleaned up and tilled up some beds. I quickly found that in the spring, usually soon after I planted seeds, rain water running off the land behind me came right through that area. It did not run fast but it kept the ground too wet. So, I dug a shallow ditch down one side and across the lower part of it. That kept the soil in my garden dry enough to let the seeds germinate. My digging days are about over but I still have some fond memories of moving dirt. This entry was posted in Fishing Ramblings - My Fishing Blog on August 20, 2018 by ronniegarrison.